London's biggest celebration of South Asian culture is back at Gunnersbury Park on 31 August. Over 80,000 people attended the free party last year and organisers say the Mela will be even bigger for 2014, so make sure you don't miss out. The main stage is hosted by Bobby Friction, Tommy Sandhu, Noreen Khan and Suzi Mann of the BBC's Asian Network, and they'll be introducing massive Bhangra artists Miss Pooja and B21 as well as chart topping Raghav and the 'Pakistani Justin Bieber' Asim Azhar (we believe that refers to his teen heart throb status rather than Bieber's cop-bothering antics). Elsewhere the BBC Asian Network has put together a bill of up-and-coming artists for the New Music Tent, and you can see dance and tabla performances, learn Bhangra, watch hip hop, comedy and lots of storytelling. There's also a funfair, craft market and — naturally — a food area where you can stuff your face with South Asian delights. The kids have plenty to divert them and the whole thing ends with an explosion of fireworks after sunset. 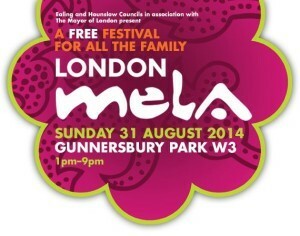 The London Mela runs 1pm-9pm on Sunday 31 August in Gunnersbury Park, Popes Lane, Ealing. Admission is free.